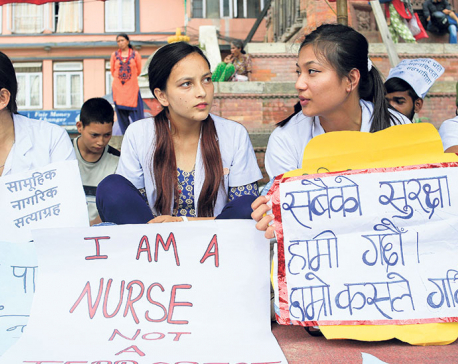 KATHMANDU, July 22: As a gesture of their continued support to the cause of medical education reform spearheaded by Dr Govinda KC, a group of civil society members has started a mass sit-in protest from Sunday at Kathmandu Durbar Square. 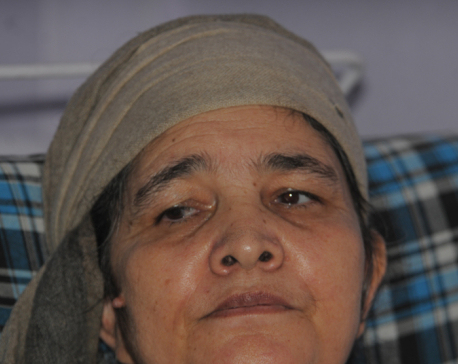 KATHMANDU, June 17: A sit-in was held today near the Prime Minister's official residence, Baluwatar, demanding the guarantee of the life of Gangamaya, who has been on a fast-onto-death for long, calling for justice to her murdered son. SARLAHI, April 16: A large number of women of Balara Municipality staged a relay sit-in on Sunday venting their disappointment against the mayor of the municipality for his “monopoly” in taking official decisions. SARLAHI, April 3: Ward chiefs of Balara Municipality along with some locals have started a relay sit-in from Monday accusing the mayor of appointing his brother to a public post. 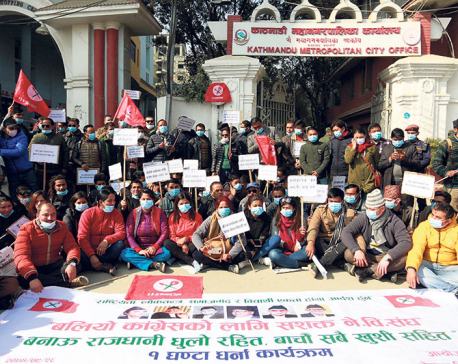 KATHMANDU, Jan 13: Irritated by the government's lackluster response to mitigate air pollution which is at an alarming level in the Kathmandu Valley, Nepal Student Union (NSU) not only organized a sit-in in front of the Kathmandu Metropolitan City office but also handed over a bag of dust collected from the streets of the capital to Deputy Mayor Hari Prabha Khadgi as part of their symbolic protest. KATHMANDU, Jan 4: A sit-in and gherao was organized by the provincial capital formation committee in front of the PM's residence, Baluwatar demanding Dhankuta as the capital of province no. 1. KATHMANDU, Jan 4: All Nepal National Free Students Union (ANNFSU), the sister organization of CPN-UML and All Nepal National Independent Students Union Revolutionary (ANNISU-R) affiliated to CPN (Maoist Center) have staged a sit-in in front of Nepal Oil Corporation (NOC), state-owned oil monopoly on Thursday. KATHMANDU, Jan 1: A sit-in has been organized near the official residence of the Prime Minister at Baluwatar Monday, demanding Dhankuta be made as the capital of Province No 1. KATHMANDU, August 27: The Association of Conflict Affected Family of Security Forces staged a sit in in-front of Truth and Reconciliation Commission office here today, calling for the Commission to incorporate them as well in the transitional justice process. 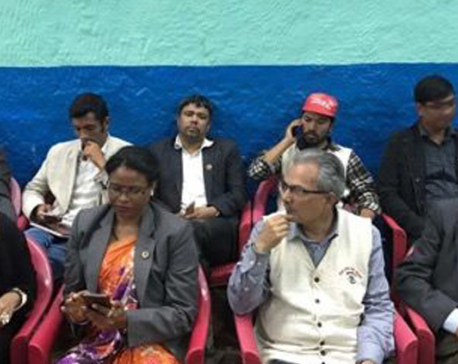 KATHMANDU, April 15: The Naya Shakti Nepal and 67 other political parties have staged a sit-in from Saturday in Shanti Batika in the capital city demanding parties' election symbols in the elections. KATHMANDU, April 2: Coordinator of Naya Shakti Nepal (NSN) has said that he would continue their on-going sit-in amid police control until their demand is met. 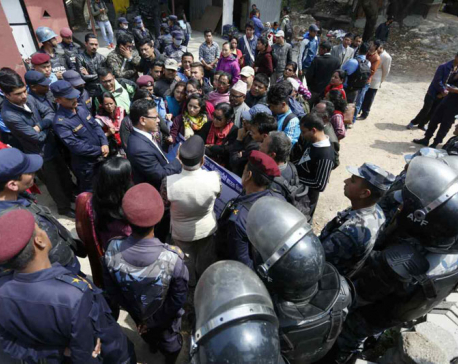 KATHMANDU, April 2: Coordinator of Naya Shakti Nepal (NSN) has been taken under control by the security personnel as the group of NSN cadres led by him tried to enter the prohibited area near the Election Commission on Sunday monrning. KATHMANDU, March 25: The Non – Violence Lovers Vegetarian Association today staged a sit-in at the Bhagwati Temple at Bhagawati Bahal in Naxal – 1 demanding an end to animal sacrifice at holy place as temples and shrines. 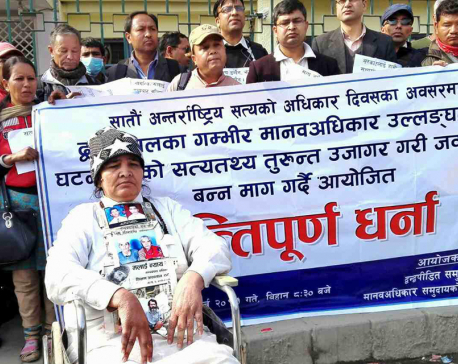 KATHMANDU, March 24: Conflict victims and human rights activists have staged a sit-in in front of Bir Hospital on the occasion of International Day for Right to Truth on Friday. 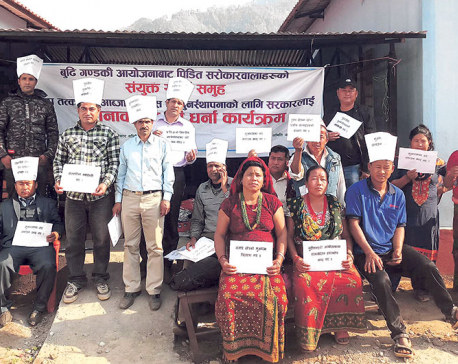 SOLUKHUMBU, March 24: Agitating locals of Tila VDC staged sit-in before the Solukhumbu District Administration Office and District Development Committee protesting the integration of their VDC into Nechasalyan rural municipality against their interests and needs. 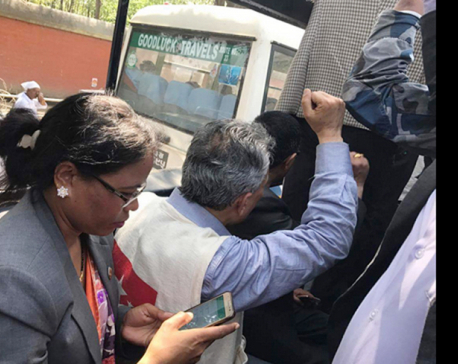 KATHMANDU, March 15: Conflict victims staged a sit-in program for an hour in front of the Truth and Reconciliation Commission (TRC) on Wednesday demanding the transitional justice mechanism to begin detail investigation over the complaints they had filed at the commission. KATHMANDU, Feb 9: Expressing dissatisfaction over the judges’ appointment at seven high courts, as well as dissatisfaction over the agreement between bar and bench regarding the issue, a group of lawyers started protest program in Kathmandu on Thursday. KATHMANDU, Oct 18: Temporary school teachers today launched a brief sit-in in front of Prime Minister's official residence at Baluwatar, putting forth various demands. KATHMANDU, Sept 30: Naya Shakti Nepal party held a sit-in at Bhadrakali Kathmandu on Friday to express its dissatisfaction against the joint statement issued by Indian Prime Minister Narendra Modi and Nepal's Prime Minister Pushpa Kamal Dahal's during the latter's India visit. KATHMANDU, Aug 30: Human rights activists today organised a sit-in in front of the Prime Ministerial official residence, Baluwatar demanding the government save the life of Ganga Maya Adhikari who is on a fast-onto-death at Bir Hospital to get murders of her son killed during the Maoist decade-long insurgency booked. KATHMANDU, July 21: Braving incessant rain, scores of youths staged a sit-in near the parliament building, New Baneshwor in support of Dr Govinda KC who is on a fast-unto-death for the last 12 days.